What would be recommended for a side arm for a newbie. I've spent a decent amount on my rifle so just looking for some advice on side arms. Pretty much down to what style of pistol you want. Why do you want a sidearm - are you going to be carrying it around most of the time or do you just want something to use as a primary weapon for certain games ? Might be a controversial approach, but it might be worth looking at holsters and leg rigs and working back to a compatible pistol. Personally I hate the style of Glocks but have quite a few other pistols, mostly WE or TM. They all have their little differences. One Im lusting over at the moment is the FNH 45 from Cybergun, because its a big weighty pistol with a hard kick blowback. 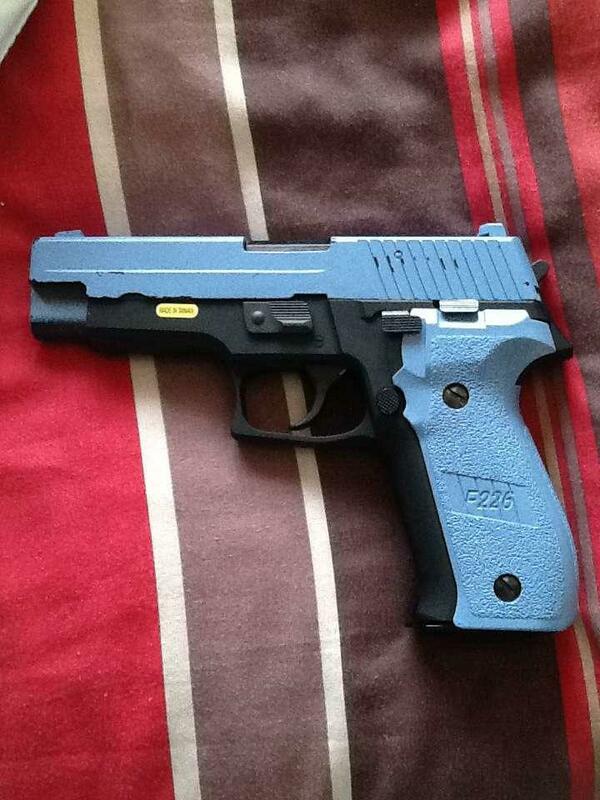 I use the WE P226, it is a very very well made and reliable pistol. It takes green gas so it's pretty cheap to run as you can get bottles for £15 which lasts quite a long time. It is full made of metal (apart from the grip) so it feels quite realistic and it also has a very satisfying kick to it. It is very accurate and each mag holds 24 BBs so you only need 2 mags which are £25 each so they arnt too expensive. Also it only costs £99 so if you've spent a lot on your rifle it's not damaging your wallet too much. I use the WE P226, it is a very very well made and reliable pistol. It takes green gas so it's pretty cheap to run as you can get bottles for £15 which lasts quite a long time. Wolf charge more because they offer a 3 for £30 (buy 2 get 1 free), but its a way for them to remain competitive while overcharging people who don't want much. No sidearm needed. You will have enough trouble learning your aeg. While sidearms look great, most airsofters only use it to fill it at the start of the day and empty the mags posing ubercool and at the end of the day. You need to learn the strengths and weaknesses of your main weapon and yourself. This takes one or two years at least. Then you will be able to effectively use the sidearm in a situation where the main weapon is weaker. Pistols are ace, the only reason I can see for not having one is financial. Really useful in woodland and invaluable in cqb. I personally love glocks, currently running a g27 which is very inaccurate due to being so small and light but has still got me several kills. Had a go on a mates hi cappa last weekend and was pretty impressed with the accuracy. One thing i'd recommend if you want to use a pistol to it's full potential is to have a sling that quick detaches from your primary weapon. The reason being that there are situations where you want to rush people and it's much faster to do so with a pistol and even better when your torso is clear from your rifle. Sidearms aren't worth the money unless you're very happy with your primary(s) and gear. Until then, spend that £100 on other things. This is how i fancy playing, in close quarters you dont want to be swinging a rifle around if you can easily access a pistol, or even a Knife!!! pop pop pop - "building clear & secure"
I personally love using a pistol, in really CQB and FIBUA situations they are awesome, no rags ratteling about no unwieldy rifle and once you get used to it, if it's s good one accurate too. But if you don't have lots of cash stick the extra you would spend on the side arm on a better rifle. See i have just bought a pistol as ahandy back up. My last game i was in a situation where i was supressing 4 players and my mag ran out in my m4. They where trying to get in thriugh a crawl space so i had a massive advantage till i was out of ammo. The speed of the mag swap cost me and i got hit as they pressed through. With a pistol i could of carried on poping off shots while i one handed mag swaped the m4 (its on a sling im obv not a ninja) so now pistol purchased as a back up! Im happy to spend the money and even if it only saves my bacon now and then its worth it. I play cqb and im sure ill find i use it plenty. Better to have a pistol and not use it than need a pistol and not have it! My advice would be to get a backup AEG before getting a sidearm. This means when your AEG does not act the way you'd expect it to, you can still play normally. GBBs can be real fun! But they are not very versatile in what kind of scenarios you can use them in, and they have little to non real advantage over an AEG. *So what I am saying is... DO get a GBB sidearm, but get a secondary AEG first! Got to agree with above get a backup aeg. Could go for something small like a G&P baby monster or Ics M4 cqb pistol or even the Krytac Sdp. While I agree with many of the sentiments here about pistols, there is one good reason to have one. Most of us do this hobby because we are interested in the different types of guns. Pistols may have questionable benefit in a skirmish but they are interesting and fun to own. If you have one, why not strap it to your leg or plate carrier and carry it in games ? it surprisingly works really good in the cold and I got through about 2-3 mags out of it ( it was in the winter and it was around 8 decrees) it has a really solid kick aswell so it feels very realistic. when people so it's not worth it, it really is. When I play CQB I leave my rifle at spawn and just play with my pistol because it's so much easier to run around with. ASG Shotgun? Never let me down since! I know this will cause no end of people telling me gas is better but I own 2 gbb pistols and 1 nbb. During the winter I was sick of cooling mags and the depressing hisssssss. I bought (for £60) a cyma cm 030 pistol (glock electric pistol) and I love it. I mainly play cqb at night and for this it is perfect. Not very powerful only around 220 fps but the hop unit is great. It's so good I now have two. I have just ordered two extended mags (80 rounds). Keeps me mobile and usually find myself taking point. Especially good if in a team with a good mix weapons. Still havnt gone back to my gas pistols and don't know if I will. Ahhhhh, nooo a man with an electric gun, Heresy. Poor internet and humour, most people use electric guns.